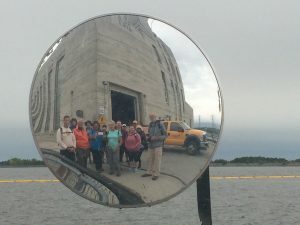 Thirteen hikers caught the bus from Pinawa Dam at 7:30 AM for the Pinawa through-hike, heading to our starting point Seven Sisters Falls Hydro Generating Station. Already the volunteers had started arriving. When Rosie pulled in with the school bus, I knew it was all going to go just fine. Weeks of planning and the day of our TCT Celebration has finally arrived. Although I’m one of the “in-charge” people at this event, my name is only one of two who signed the permit to rent the park – I’m taking the easy way out. I take off with the dozen other through hikers and head off for a day of the most pleasant hiking I’ve had in a very long time. I’ll leave Ray in charge in my place. 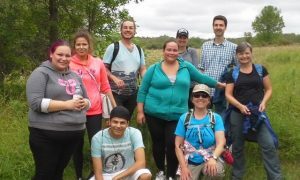 We are going to hike all 30 kms of Pinawa’s TCT. 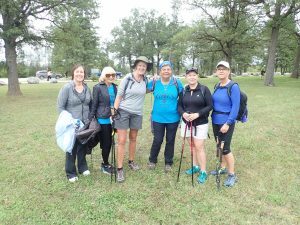 My group is fantastic – neophytes tend not to sign up for the longer hikes. We are a mix of locals and city people – oldest hiker 79 but I have two local women arguing about who is older – both in their 70’s. All three are inspirations for me. 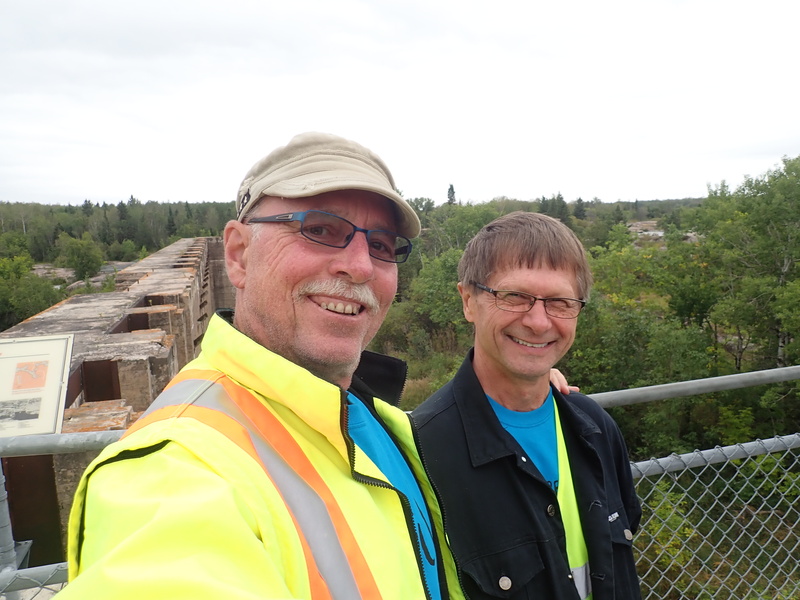 It rains on us a bit – not much – takes us three hours to hike the 15.5 kms to the Pinawa Club. Everyone needs a break. Some people packed a lunch and ate at the picnic shelter at the beach, the rest ate at the Pinawa Club. 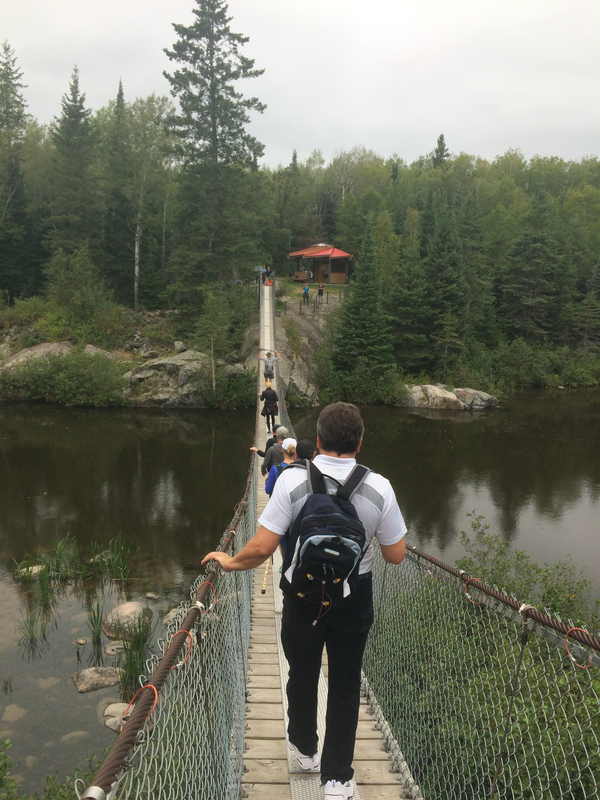 Six more hikers arrive to join us here, including Pinawa’s Mayor and my doctor. Colleen French is guiding this group. We head into true wilderness from here. At the Suspension Bridge we run into the cyclists and Rosie arrives with the bus to bring yet more hikers. I actually shed a tear when I started counting the people getting off this bus – 25 more. At least a dozen of these people had just hopped on the bus at Pinawa Dam. Diann Elliot is guiding this group, and has her hands full. I took a few of the hikers ahead with me while she gave the rest a tour of the Suspension Bridge. “Concerns that I had that I might end up at the Suspension Bridge on my own soon turned to concerns about how I would lead a group of 25 on my own when two groups of 5-6 hopped on the bus at the last minute. They’d gone to Old Pinawa for the afternoon, heard about the hike and were just in time to join us. I really looked forward to connecting with Donna’s group. Some of Diann’s group at Bridge number 3 – almost there! 10 of my group decided to continue on with Donna rather than have a look at the Suspension Bridge. As we were about to head out to the bridge , which her group had just left, we were warned that a bear had just jumped over the cemetery fence and was headed toward the bridge. We looked up the trail and there was the bear! 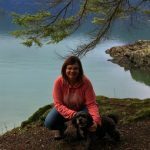 Having concerns for everyone’s safety and not knowing where the bear might go I decided that we would forgo the bridge and continue with the hike. Everyone seemed to be ok with that plan as they could return to see the bridge another time, and they were excited to have seen a bear. The rest of the hike was uneventful, which was a good thing! Everyone enjoyed the scenery and the quiet ( though it did get too quiet for a couple of people). They were tired but all smiling at the end ( the photo is at the third bridge). This was one participant’s first ever hike so he was excited to have seen a bear and the wonderful scenery and the distance was perfect. We all made it, tired but intact. The same hiking adventures had repeated themselves on the Lac du Bonnet trails while we were gone. The Avenue Eatery food truck had an hour-long wait for dinner, but it was worth it. We had speeches and smoke ceremony – and formally opened up the Lac du Bonnet trail – our two communities now finally connected. The rest of the evening was music and dance – the rain couldn’t wait any longer and we all had to crowd into the tent. 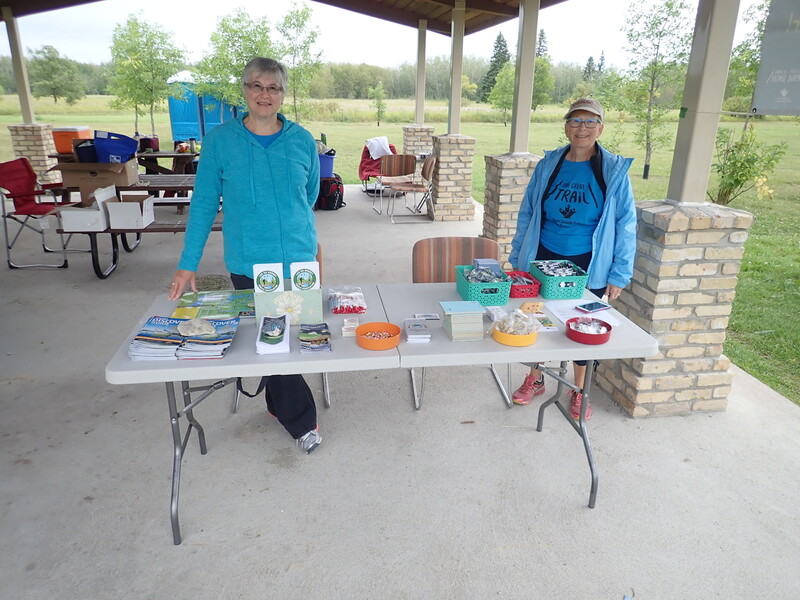 Thanks to: the 80 participants (just on the Pinawa side), the 50 volunteers at the event, my cohorts in crime on the planning committee Kathy Picard, Maryanne Shipley, Carol Lesko and Marsha Sheppard. My husband Ray and Carl Sabanski for being “in-charge” people while their wives spent the day on the trail, Avenue Eatery for the fabulous food all day, Rosie the bus driver for her smiling service, Solo store in Pinawa for all of the free oranges, Sunova for some awesome water bottles, all of the entertainers, the Trans Canada Trail organization for their generous grant and the Canada 150 Celebration committee for making sure the Great Trail was part of the celebrations. Awesome, I wish I could of been there….Back issues this year and having to work that day kept me away, but is does sound like a super day. Maybe next time.